MC and Ac cable are newer than BX. They have a separate ground wire in them, which is a good thing. These cables are tougher than their non-metallic cousins. consequently, they are more resistant to nails or screws, or other incidental contact. You will often see it installed in garages and unfinished basements. non-metallic cables are generally not supposed to be run on surfaces where they are exposed to damage, so MC/AC cables are the preferred method. 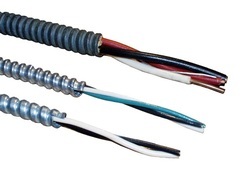 An AC cables jacket is considered and proper ground path, so it does not require a bonding screw to the box. It is never acceptable to run a metallic cable to a plastic box. It is however OK to use a metal box with non-metallic wiring.